? Day to Day producer Christopher Johnson profiles reggae music legends Sly Dunbar and Robbie Shakespeare, the drum and bass rhythm team that kept the beat for countless reggae artists as well as their own bands. 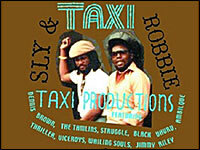 The duo celebrates the 25th anniversary of their record label Taxi, and are marking their long musical partnership with a U.S. tour.